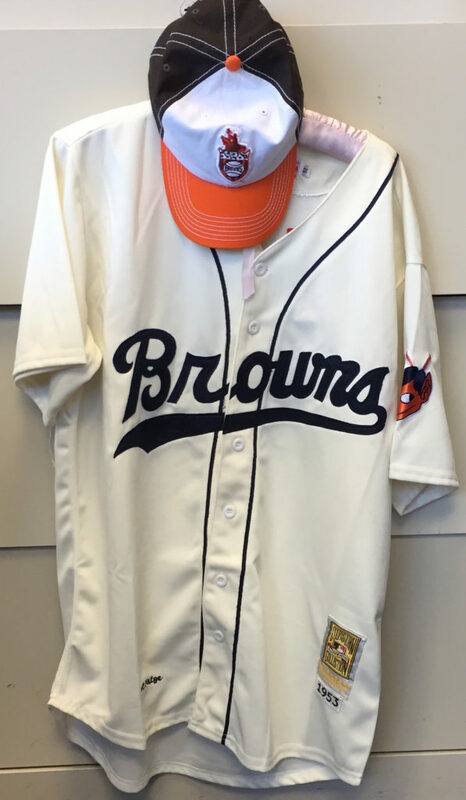 Here’s a sampling of the Browns memorabilia on display in the office of Emmett McAuliffe, an attorney in St. Louis. 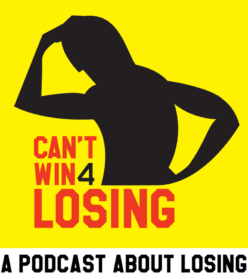 Listen to the episode to hear McAuliffe talk about how and why he became interested in the Browns, a team that moved to Baltimore before he was born. 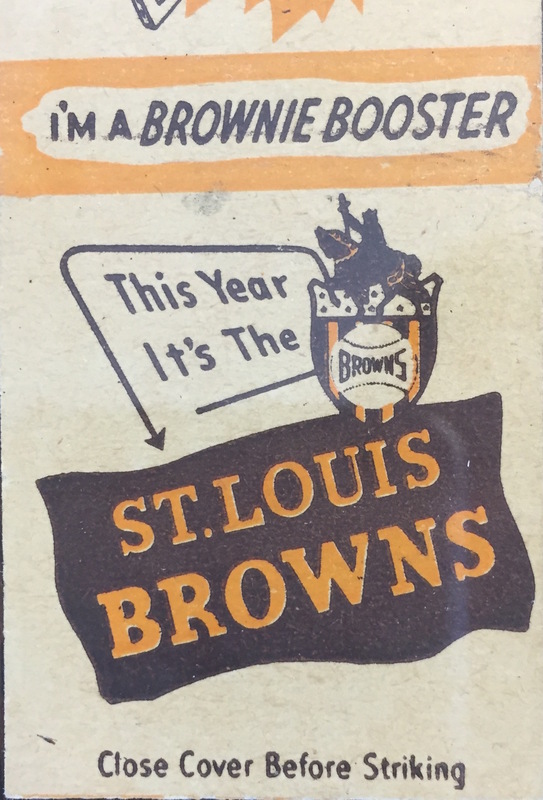 This handsome “Browns” script was only used on the uniforms in the team’s last two years in St. Louis, 1952 and ’53. 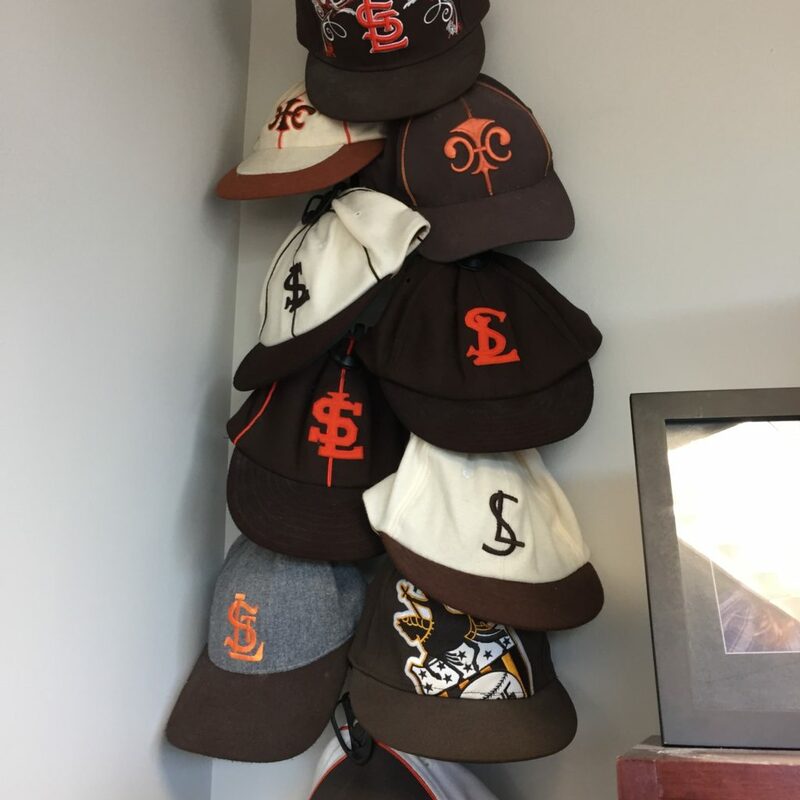 A collection of uniform and souvenir caps. McAuliffe says he grabs one on his way out to the ballpark. 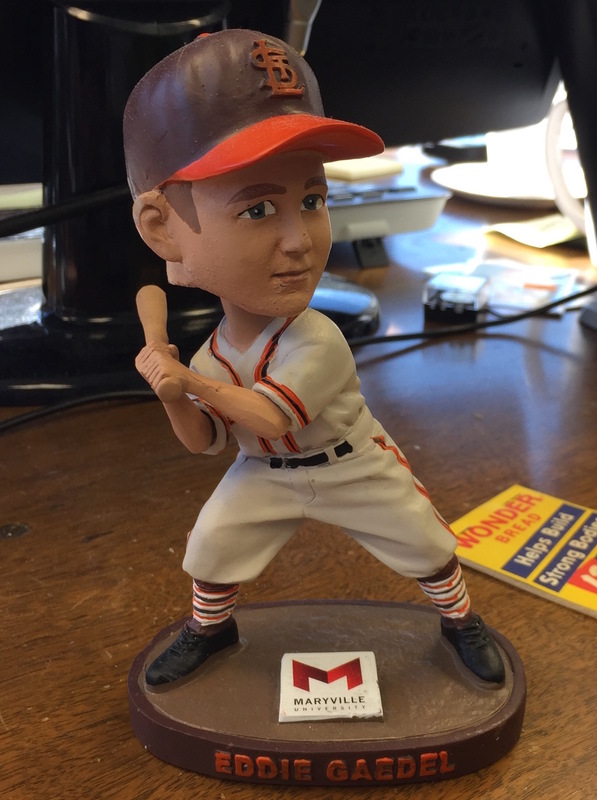 The most famous Brownie of them all, Eddie Gaedel, in bobblehead form. In real life, he was 3-foot-7. 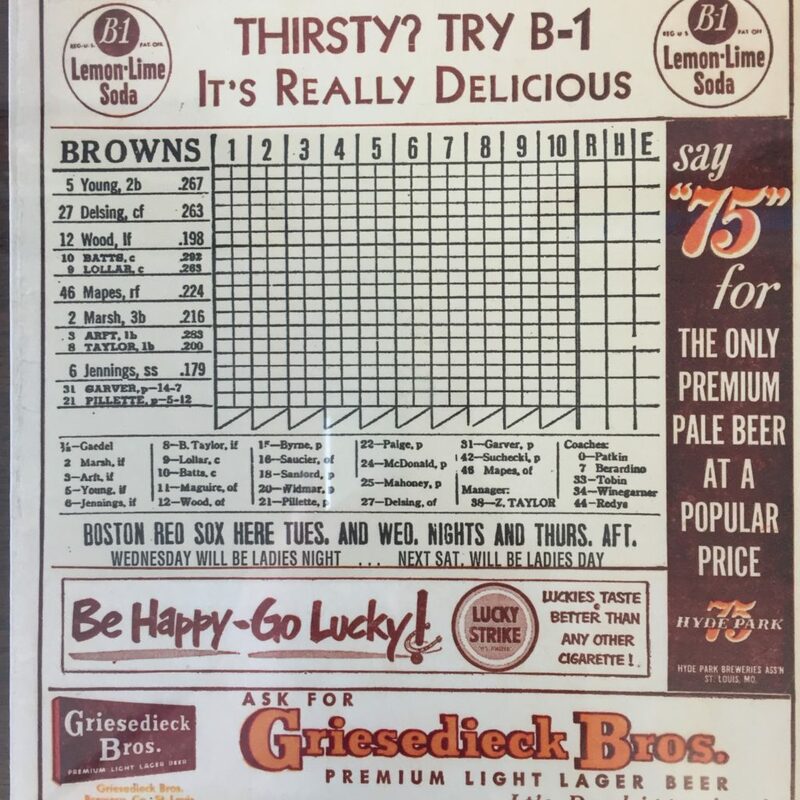 If you’d looked closely at your scorecard on Aug. 19, 1951, you’d have noticed Gaedel’s name on the roster. You might have mistaken his number for a printing error, a smudge, but if you looked closely, you’d have seen it was 1/8. 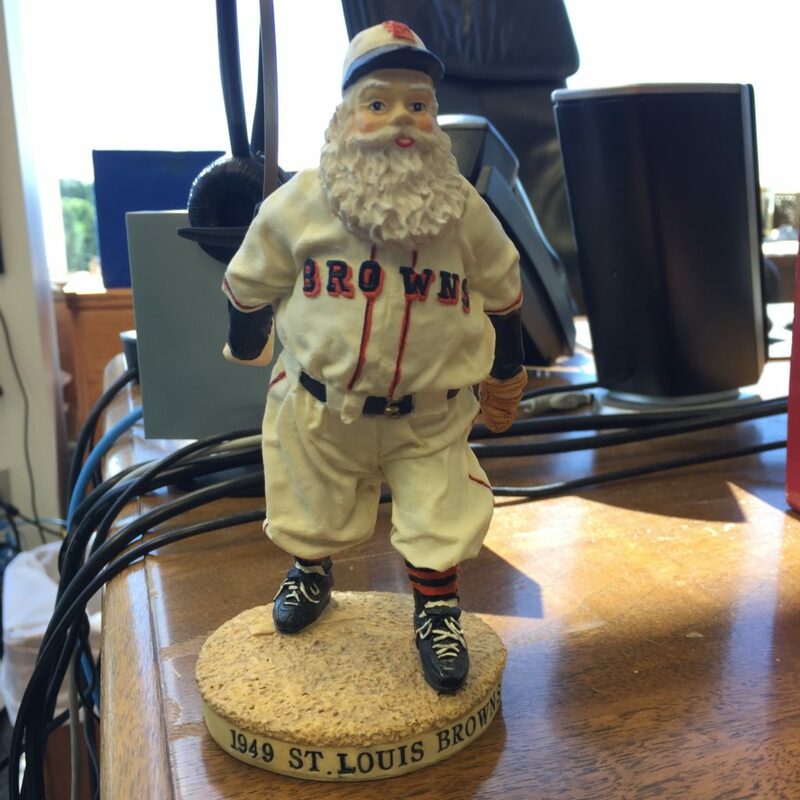 Did Santa play for the Browns in ’49? Don’t put anything past Bill Veeck. 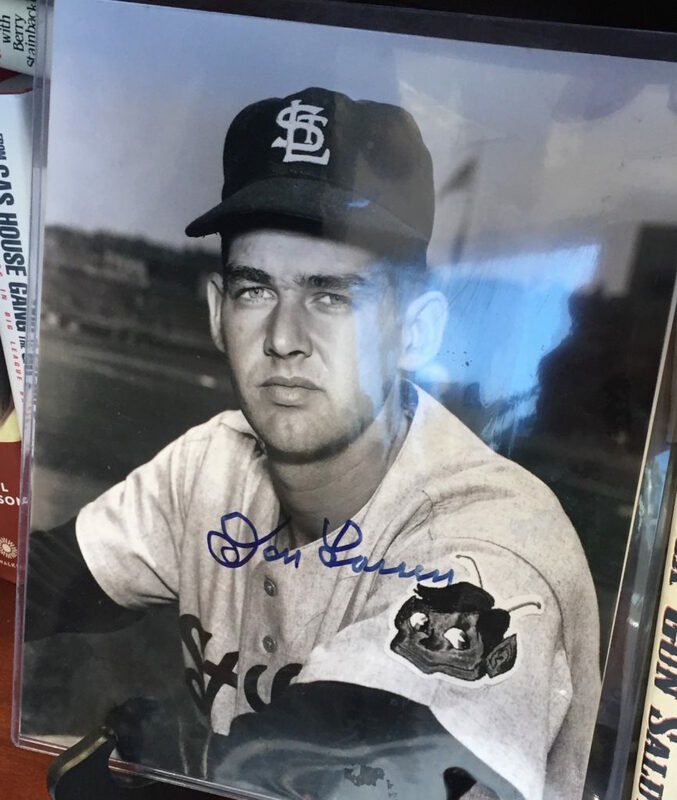 An autographed photo of Don Larsen, famous for pitching a perfect game for the Yankees in the 1956 World Series. But he was a Browns rookie in 1953, their final year, and pitched for Baltimore in 1954. 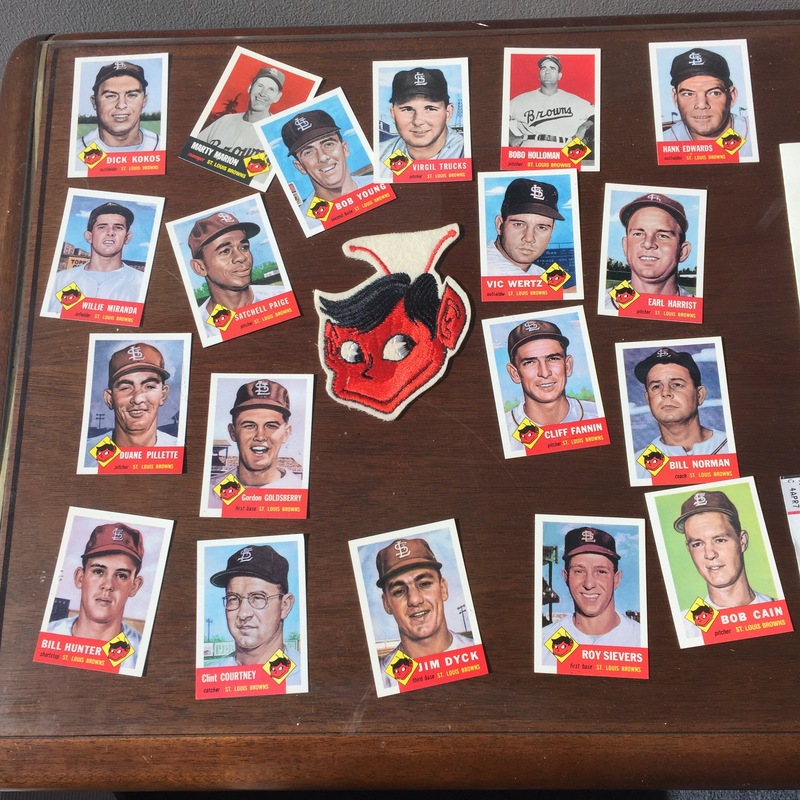 Some baseball cards. 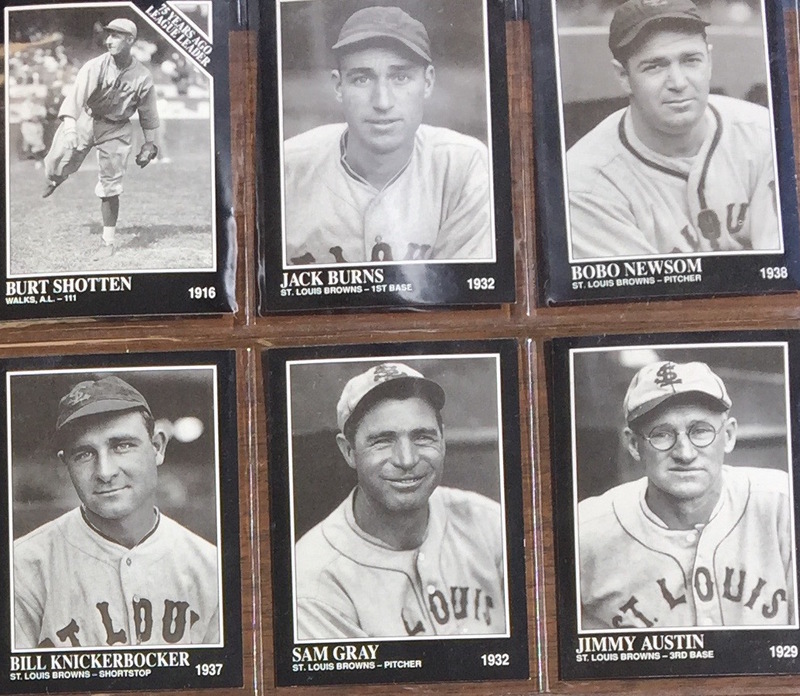 At lower left is first baseman George Sisler, the Browns’ greatest player. Thought of as the next Ty Cobb — who was still playing — he was on his way to an all-time great career when he was sidelined for the entire 1923 season with a bad sinus infection. Only 30 at the time, he was never the same player, though he had some good years after that. He was inducted into the Hall of Fame in 1939. Outfielder Heinie Manush, in the center, was also a Hall of Famer, though he only spent about two and a half years with the Browns. A few more cards. Pitcher Bobo Newsom was a colorful character who spent three different stints with the Browns. That’s nothing, though. He was a Washington Senator five different times! 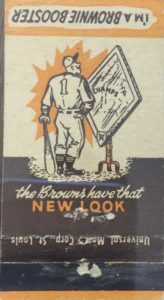 Burt Shotten was a good outfielder for the Browns in the teens, but he’s best remembered for managing the Brooklyn Dodgers during Jackie Robinson’s rookie year in 1947. One last set of cards — beauties. Note Satchell Paige in the second row. That should be spelled Satchel. Duane Pillette, second from the bottom on the far left, pitched all 11 innings in the Browns’ last game. Virgil Trucks and Vic Wertz were both All-Stars before and after their brief stints with the Browns. Wertz is most famous for hitting the ball that Willie Mays caught in the 1954 World Series in what’s known as “The Catch.” He was playing for Cleveland at the time. 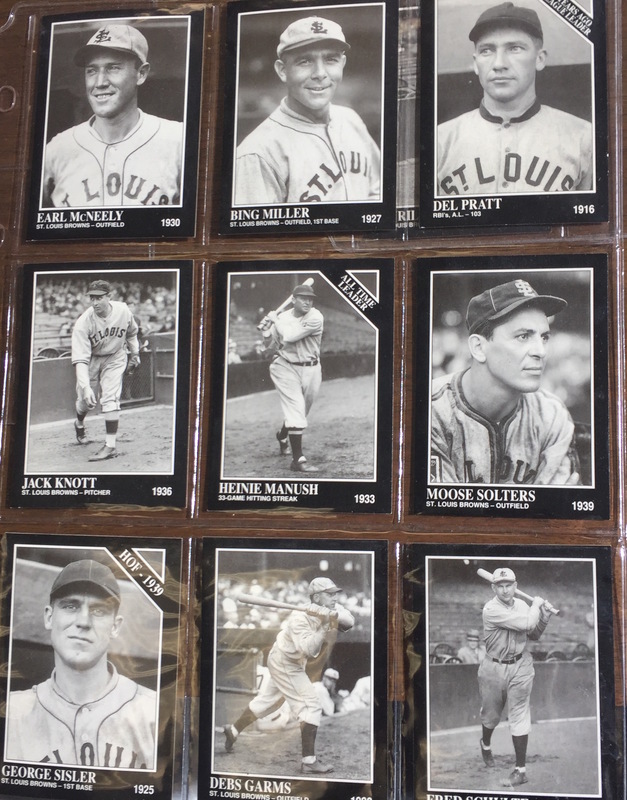 Marty Marion, at upper left, was a great shortstop for the Cardinals throughout the ’40s. 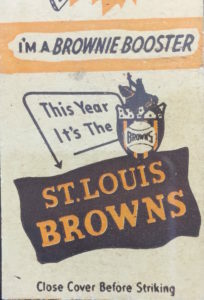 The Browns brought him over as their player-manager in the early ’50s. It was common for the Browns to sign old Cardinals stars. 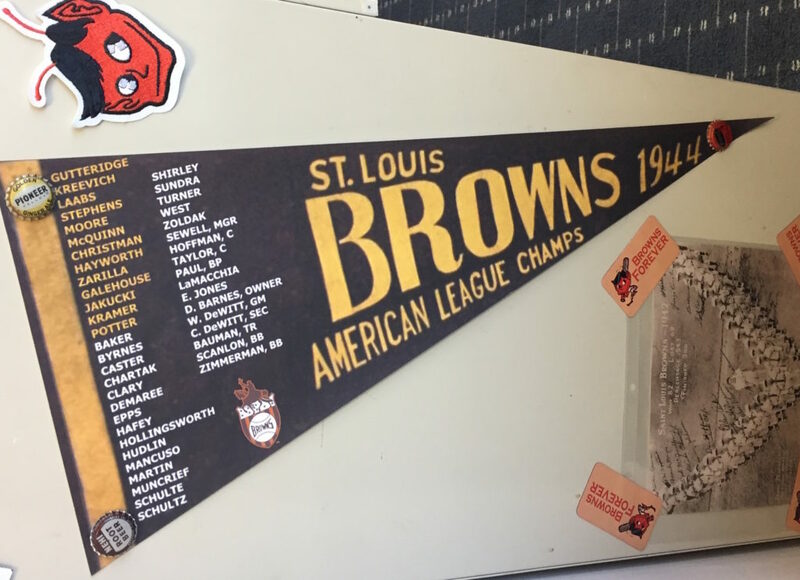 We’re looking sideways at this hanging pennant from the Browns’ only pennant-winning season, 1944. They lost in the World Series to the Cardinals, who weren’t cross-town rivals — they played in the same park. 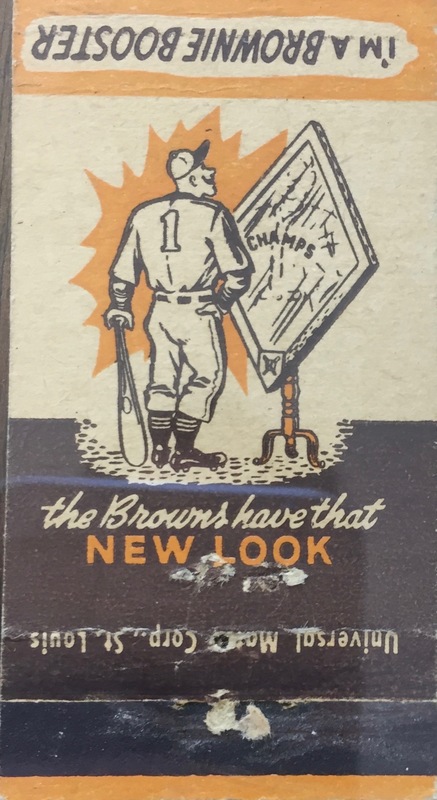 The photo at the bottom is the Browns’ unusually decent 1942 club, which finished third. It was one of 12 seasons — out of 52 — that the Browns posted a winning record.